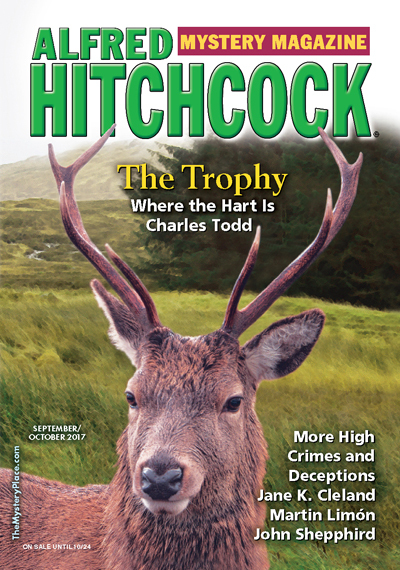 "Aramis and the Worm," by Michael Mallory, in ALfed Hitchcock's Mystery Magazine, September/October 2017. My friend Michael Mallory is making his fourth appearance in this space, his second time this year. Being an actor he often writes about show biz and this is the case today. Adrian Keel used to star in a lot of Grade-B movies filmed in exotic locations. Key phrase is "used to." He is ninety years old, lives in an apartment in London, and has all kinds of medical problems. He wears adult diapers. "The Cold War is coming back, Adrian, and worse than ever." "You believe Putin to be that dangerous?" Adrian set down his wineglass. "I've heard nothing of that." :Nor has anyone else on the outside. That bald, glowering, bare-chested man you see on the television is not Vladimir Putin., it is a brilliant double." And then things get complicated. A wild ride. "Cabin Fever," by David Edgerley Gates, in Alfred Hitchcock's Mystery Magazine, September/October 2017. This is the fifth appearance in this space by David Edgerley Gates, which ties him with James Powell, and leaves him topped only by Terence Faherty. It is his second showing here since he joined SleuthSayers where I also blog. Somebody said the essence of story is this: throw your hero in a hole and drop rocks on him. Let's count how many rocks fall on Montana deputy Hector Moody. That's just the set-up. The situation will get much worse. A real nail-biter, with terrific dialog. "Sure Thing," by David Rich, in New Haven Noir, edited by Amy Bloom, Akashic Press, 2017. If a leopard had strolled up the stairs and into the big room, or a giggling leprechaun had slid down a light beam, the reactions of the patrons at Sports Haven could not have been any stronger. Nice writing, that. The cause of the shock was a beautiful actress named Addie walking into the sports bar. Not a very classy place, apparently. "What kind of wine do you have?" "The kind that used to be red when I opened it three weeks ago and the kind that used to be white." The bartender delivering that bad news is Pete, and Pete has a secret or two. He helps Addie out of a messy situation and some secrets are revealed. The result puts both of their lives in danger. 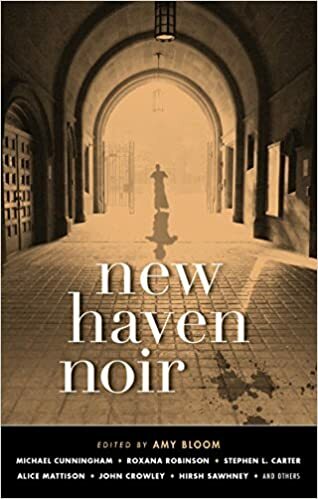 "Crossing Harry," by Chris Knopf, in New Haven Noir, edited by Amy Bloom, Akashic Press, 2017. Knopf is making his second appearance here. I am very fond of what I call heightened language, which simply means that the words do something more than get us from the beginning of the story to the end. It doesn't have to been high-falutin' fancy words. Hemingway's monosyllabic language told us a lot about the world he was describing. This story has a good plot but it is the language that puts it over the top. Here is our nameless protagonist, a homeless man, explaining his love of biology. I'd loved it since I was a kid. I'd absolutely be hunched over a lab counter right now if I hadn't had that little hiccup with the voices in my head and the collusion of the Yale Board of Trustees, the United States Chamber of Commerce, and the Satanic Monks of Aquitaine to deprive me of my undergraduate position. But our hero is pretty cheerful. He likes his "house [which] is this nice little spot under the railroad tracks that mostly keeps out the rain and snow." Of course, some conflict must occur even in this paradise, and it takes the form of a very strange man at Union Station whom no one notices except the homeless man and Harry. Did I mention Harry? No one can see him except our narrator, because he's from another dimension. But Harry isn't the problem. It's the elegantly dressed man with a canvas bag full of-- well, nothing nice. Don't worry, though. Our guy and Harry are on the case. And a terrific case it is.